This product is currently unavailable. Check out other Infinity massage chairs we've analyzed. The Infinity IT 7800 Therapeutic Massage Chair is a solid, if unremarkable budget-priced chair. If you’re looking for a good, basic massage, this one will please, at a price you can afford. Recommended for hobbyist users. Are you looking for a decent massage chair offered at a budget price? 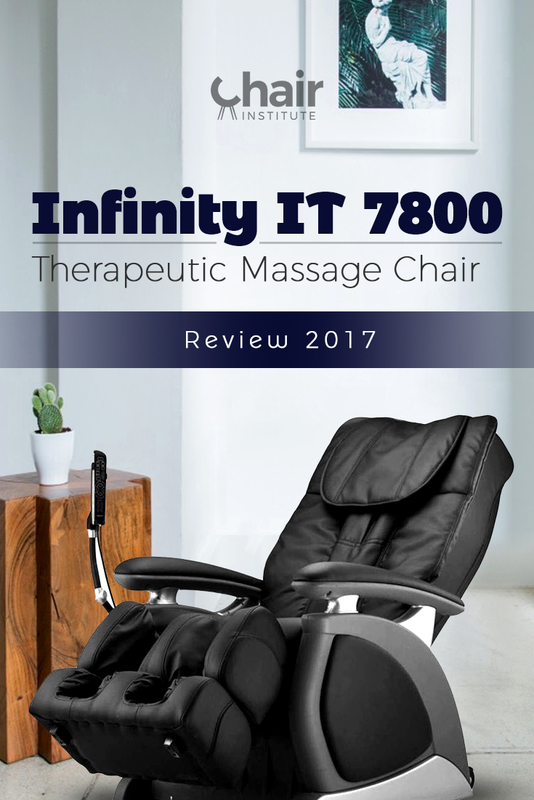 If so, then you’re going to be interested in our Infinity IT 7800 Therapeutic Massage Chair review. As an entry-level chair, it’s got certain limitations, but it is well-designed, and with one notable exception (covered later) its features are solidly implemented. Although the chair provides no real therapeutic benefit, we think you’ll agree it offers excellent value for the money. Let’s take a closer look at the features that drive it. We have to make a point of clarification on this first feature. The 7800 is built around a standard S-Track and utilizes an unusual tri-roller system (two at the bottom, and only one at the top) to render its massage. The user manual indicates a six-roller system, and while it’s true that there are six rollers total that travel the length of the track, that’s not the same as a six-roller system, which would have twelve total rollers, six on each side. This could be a language barrier issue but is something we wanted to make clear. Quad rollers are the current industry standard, so the massage quality suffers marginally in their absence here, but the result is certainly acceptable, especially in the entry-level price range. The Infinity IT 7800 massage chair does not utilize 3D Body Scanning Technology. Instead, it relies on buttons on the remote, which enable the user to manually position the rollers and adjust the width of the massage field. If you’re a fan of convenience and automation, you’re likely to consider this a strike against the chair. On the other hand, the manual approach guarantees that the rollers will always hit exactly the spots you need them to. Unfortunately, the feature simply isn’t present. The company’s website makes no mention of it, and there’s no reference to it in the manual, nor is there a Zero-G button on the remote. If you’re looking for an entry-level chair offering Zero-G seating, this isn’t the one for you. So style-wise, it’s got the basics covered, plus it offers one advanced technique. At the budget end of the price range, that's pretty good, as you’re by no means guaranteed to get access to any advanced styles at all. Kudos to Infinity for that! In addition to these, the chair also provides partial massage modes for the upper and lower back, and a spot massage function. This last feature is interesting because it’s not something you typically see in entry-level chairs. When you press the button, it will interrupt whatever massage program you’re running and focus the rollers in an area six inches in diameter from where they were when the button was pressed. All massage options can be customized via the remote up to three intensity levels, and all massage times default to a fifteen-minute duration. Unfortunately, the model does not offer a timer adjustment feature, so there is no way to modify this. The Infinity IT 7800 features 12 Second Generation Airbags. This isn’t a huge number, and the chair does not offer a full body air massage, but that’s an advantage here because it means that the few airbags it does have are concentrated in fewer locations, resulting in a better massage in those areas. Specifically, you can enjoy an air massage of your hips, glutes, and calves. Note that the air massage is binary. There is no option to selectively activate them by body region. You either turn Air Massage Mode on, or you leave it off, although you can customize the massage through three intensity levels. Most of the chair’s 12 airbags are in the leg massage ports, so the calf massage is quite good (better than most comparably priced chairs). Unfortunately, there are no foot rollers at the bottom of the foot wells, so all you get is a calf massage. If you spend several hours a day on your feet, this chair will offer you no relief, and you’ll want to consider some other model. The remote that comes with the chair is no more complicated than a standard TV remote, so even users who aren’t especially tech savvy will have no trouble mastering the chair. You’ll be able to sit down and start enjoying your first massage in a matter of minutes. As you can see based on our Infinity IT-7800 review to this point, the chair does have the basics pretty well covered. Some of its features aren’t implemented optimally, but that’s fairly common in budget-priced chairs because manufacturers are always on the lookout for ways to further reduce the price. Quad Rollers – We totally understand the desire to cut costs, but quad rollers are the current industry standard. Reducing the number of rollers has a direct impact on the quality of the massage, which puts this chair at a slight disadvantage when compared to others in its price range. By itself, that’s not enough to be a deal-breaker, but we found it somewhat disappointing. No Zero-G seating positions – Since many people are under the impression this chair has them, this would be a natural feature to add during the next model upgrade and would more-or-less offset the lack of quad rollers if the company opts not to upgrade that aspect of the chair. No foot rollers – The calf massage is okay, but the foot massage is nonexistent. A significant number of people who buy massage chairs spend a lot of time on their feet, so this is an important feature. Its absence means that the 7800 outright ignores a significant segment of the market. The Infinity IT 7800 Therapeutic Massage Chair is by no means a perfect massage chair. There are some things it simply cannot do, and we feel that calling it a “therapeutic” massage chair is a misnomer, as there are no therapeutic features on offer. It’s a fine hobbyist-level chair, and well-priced, but if you’re looking for a model with substantial therapeutic benefits, this isn’t it. On the other hand, if you’re a hobbyist, and looking for a solid chair that delivers a decent massage at a good price, this one is worth a look. It’s not for everyone, but the right user could be very satisfied with this model. Infinity Massage Chairs, Official Brand Website. The benefits of neuropathy massage therapy, The Foundation For Peripheral Neuropathy. The effect of compressed air massage on skin blood flow and temperature, PubMed. Massage Therapy, Northwestern Health Science University. Benefits of Massage Therapy, Massage Therapy. Copyright 2019 by Chair Institute.